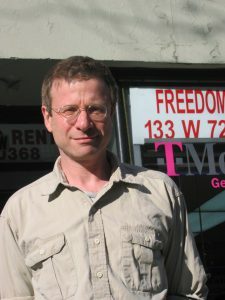 Peter Cohn is a New York-based filmmaker. Cohn's latest film, Holy Land, premiered at the San Francisco Jewish Film Festival in July 2014. Holy Land is his fourth feature. His previous film was Power and Control: Domestic Violence in America,(2010) which followed a mother and her three children through a Duluth, MN domestic violence shelter, and also explored the evolution of society's response to gender violence. Cohn's theatrical feature Drunks (1995) premiered at Sundance, aired on Showtime, and won the entertainment industry Prism Award for its realistic depiction of alcoholism. Golden Venture (2006) recounts the story of the Chinese immigrants aboard a freighter that ran aground off NYC, premiering at Tribeca. Cohn is also actively involved in producing web-based content and social media. The new Holy Land web site (www.holylandfilm.com) offers a library of video profiles and interview excerpts, as well as extensive additional educational resources. The web site for Power and Control (www.powerandcontrolfilm.com) continues to be a primary Internet destination for domestic violence videos and resources. Cohn's digital work includes an early 2000s stint at a startup seeking to develop an AI-based, interactive consumer advice platform, and he has studied application development and design at Columbia. In 2006, Cohn launched Hillcrest Films, which specializes in educational distribution. He recently served a two-year term as minister of finance of the New Day Films filmmaker distribution cooperative, and was a founder of New Day's digital distribution arm, New Day Digital. Cohn began his film career as a screenwriter, working on projects for Disney, Fox, MGM and a variety of independent producers in the US and Europe. Before starting in film, Cohn was a founder of a highly successful humor-publishing group, which produced the Off the Wall Street Journal newspaper parodies and other publications. He began his career in daily newspaper journalism, reporting for the Richmond Times-Dispatch and the Hartford Courant. He is a graduate of the University of Chicago.